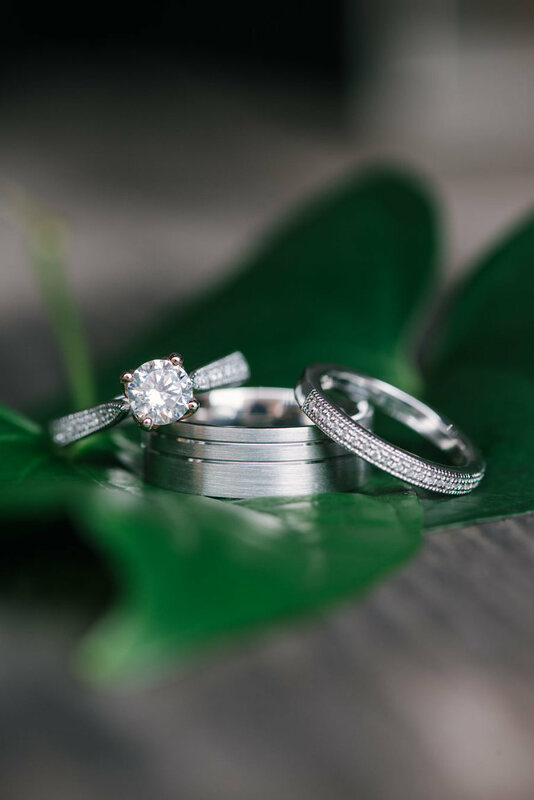 In search of a Tampa Bay wedding that inspires community resourcefulness and incorporates eco-conscious elements, this environmentally friendly styled wedding shoot transformed an urban, downtown Tampa wedding venue into a Caribbean marketplace. “In all my travels, I was always really inspired by the resourcefulness and simple beauty that came alive in market settings. 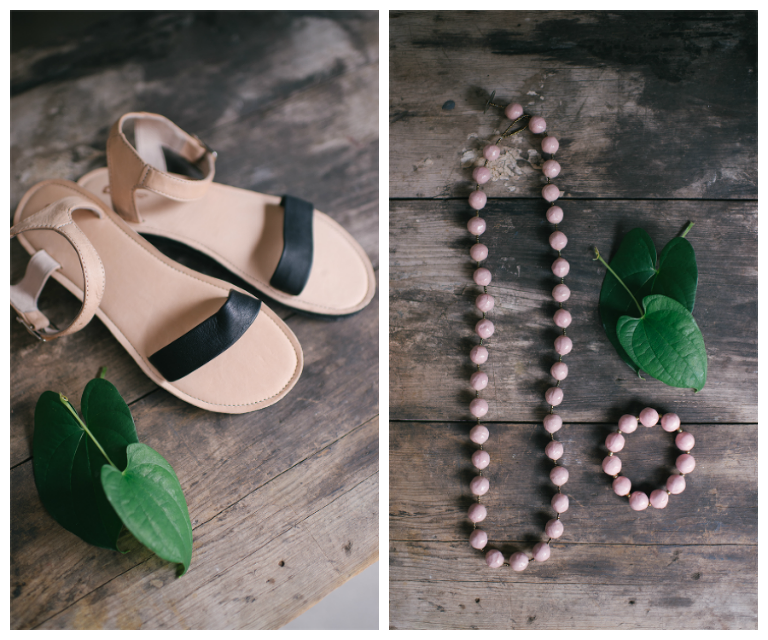 I wanted something different that could play off all the various textural elements you would find while traveling in a tropical setting,” Danielle Calhoun, editor of the socially conscious wedding blog Black Sheep Bride shared. “We used all organic farmer’s market produce, artisan made baskets, napkins and jewelry. The dress was made from an eco-friendly designer and the paper goods are made from recycled paper. We also forged for all of the foliage and selected plant life that was sustainable. The bouquet was also made with upcycled fabrics by artisans in Haiti,” Danielle added. 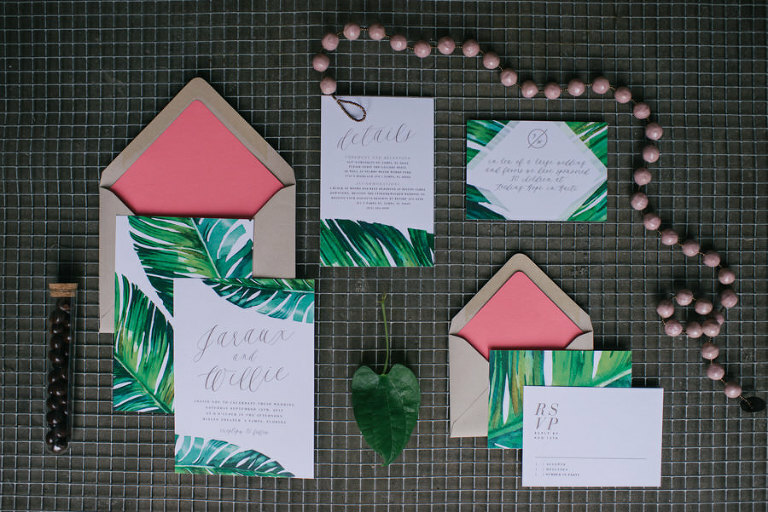 Inspired by the colors of the tropics, Tampa wedding invitation designer Citrus Press Co. coordinated a beautiful suite of tropical leaves and vibrant colors to reflect the artisan inspired decor. Banana leaf design accents were incorporated on the napkin ring name card down to the natural table runners. The table design was beautifully pieced together by Tampa wedding planner Pea to Tree Events, the lead designer of this styled shoot. The owner, Georgette, tactfully combined a caribbean flair with an artisanal market vibe. To enhance the market inspired theme of this event, fresh tropical fruit flanked the table in lieu of flowers. The candlelit reception table decor created a soft natural light, adding to the romantic feel of this downtown Tampa wedding reception. Each table’s resourceful tropical inspiration created an eclectic and earthy vibe perfect for a Florida wedding. 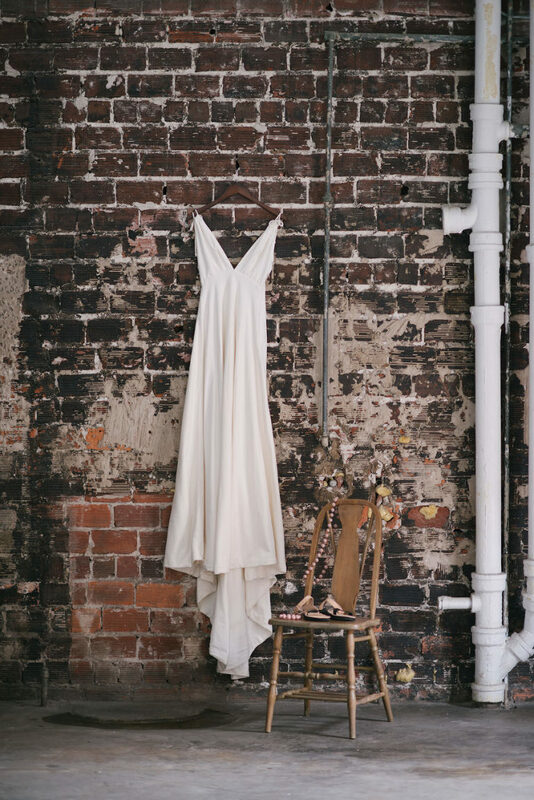 What made this styled wedding environmentally friendly? We used all organic farmers market produce, artisan made baskets, napkins, and jewelry. The dress was made from an eco-friendly designer and the paper goods are made from recycled paper. We also forged for all of the foliage and selected plant life that was sustainable. The bouquet was also made with upcycled fabrics by artisans in Haiti. How would you describe the styled shoot wedding theme? Caribbean market inspired. I have always found my fondest travel memories in the markets of the world, so this theme was very near and dear to my heart. What were the styled shoot wedding colors? We went with an organic color palette, inspired by palm leaves, mangos and bananas.